What are the possession of marijuana laws for minors? Can you be arrested for being high? Legislatures have passed laws against the use, sale, and possession of marijuana. Because the “use” of marijuana is illegal, it’s possible to be charged and/or arrested in most states for being high without actually possessing any marijuana or paraphernalia on your person. However, some states have passed laws authorizing doctors to recommend small amounts of marijuana for personal medicinal use. 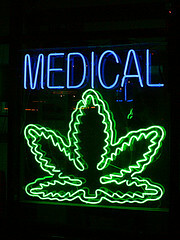 In October, 2009, the U.S. Attorney General announced that the federal government would not be prosecuting persons involved with medical marijuana as long as they were in compliance with their state’s laws even though the substance remains illegal under federal marijuana laws. Medical marijuana is legal in the following states: Alaska, Arizona, California, Colorado, Delaware, District of Columbia, Hawaii, Maine, Maryland, Massachusetts, Michigan, Montana, Nevada, New Jersey, New Mexico, Oregon, Rhode Island, Vermont and Washington. If you are under 18, then it’s possible to obtain a medical marijurana card depending on your medical condition and the laws in your state. States that allow minors to be issued cards may require a medical examination as well as the consent of the minor’s parent or guardian. The parent or guardian also may be required to apply for a medical marijuana card on behalf of the minor, to be the minor’s caregiver and to control the minor’s possession and use of marijuana. Read more about the various issues surrounding medical marijuana and teens here. For more information about the laws in your state, click here. In 2003, 197,100 juveniles were arrested for drug abuse violations; 83% were teens ages 16–17. In 2003, 46% of high school seniors said they had tried marijuana in their lifetime; 35% reported using marijuana during the previous year. Update: Alaska, Colorado, Washington, Oregon, Maine, Massachusetts, Nevada, and the District of Columbia have approved the use of marijuana for recreational purposes. The law allows anyone 21 years of age or older to buy up to one ounce of marijuana. In California, voters did the same in 2017, effective January 1, 2018. Violation of any drug law will result in some form of legal action. If a first offense involves a small amount of marijuana, you may be placed in a diversion program. This means you′ll be required to attend drug information classes and possibly participate in random drug testing. After you complete the classes, your case will be closed, with no arrest or juvenile record. If you fail to complete the program, formal charges may be filed. Any minors convicted of a drug violation face penalties that may include detention time, probation, and suspension or loss of a driver′s license. Many teens claim that they turn to drugs to avoid pressure, relieve stress, and help handle depression. But drugs, including marijuana, are a health risk. 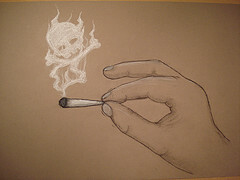 (For example, marijuana contains up to 400 chemicals that can pose major health hazards.) Believing that pot is the least dangerous of recreational drugs, more young people are using it—despite statistics showing that marijuana use often leads to experimentation with harder drugs. For some straight facts about marijuana, see the following article from Upfront, the New York Times teen news magazine dated October 24, 2011: “Marijuana Facts: Breaking Down the Myths“. A conviction on a marijuana charge goes on your record (through a local and national computer system that records arrests, convictions, and sentences) and can follow you throughout your life. Future job opportunities may be jeopardized because of teenage drug use or experimentation. A teacher in Illinois recently lost his job when a background check turned up a 1974 conviction for marijuana possession. In 1987, Douglas H. Ginsburg was nominated for a seat on the U.S. Supreme Court. He withdrew as a candidate when it was revealed that he had used marijuana as a student and later as a professor at Harvard. There′s help for anyone with a drug problem. A phone call to a local teen hotline, or any of the 12-Step programs in your community (Alcoholics Anonymous, Narcotics Anonymous, Cocaine Anonymous, etc.) is a first step toward recovery and a drug-free life. See the resources listed below, click on your state in our Teen Help Network or search online for more resources in your area. • You have new friends who abuse alcohol/drugs. • Your grades drop, you fail tests, or you miss a lot of classes. • You withdraw from family and friends; you become isolated and lie about your drinking/drug use. • You experience mood swings, depression, and a loss of interest in your usual activities. Legislatures have lowered the minimum age for obtaining help for alcohol and other drug use to encourage teenagers to take action. If you′re afraid to go to your parents for help, ask your school nurse or counselor, or call a confidential hotline. Drugs and Your Brain by Beatrice Grabish (Rosen Publishing, 1998). of addiction, and where to turn for help. 150 ways to feel really, really good—naturally, safely, and creatively. For counseling and referrals in emergencies. Information about the national organization and local groups. Not a hotline. Information on D.A.R.E.′s anti-drug, anti-violence message for kids, parents, educators, and D.A.R.E. officers. For drug-related information, referrals to local treatment programs, and support. Referral network that provides information on specific drugs and treatment options, and referrals to public and private treatment programs, self-help groups, and crisis centers. The Clearinghouse is a one-stop resource for information about preventing and treating alcohol and substance use disorders. A hotline for information, referrals, and crisis counseling, sponsored by the U.S. Department of Health and Human Services. Also see: www.teens.drugabuse.gov or www.scholastic.com/headsup for additional information. This award-winning site is packed with factual information, links, and resources on alcohol and drug abuse. 2 days ago i was caught at school with a wax pen in texas im 16 what type of consequences am i looking at? Dear Issac: We recommend that you take a look at the school’s Student Handbook or Code of Conduct. Both may be on the school’s website, or are available in the front office. Since wax pens are heating devices, commonly used to vaporize a liquid or wax containing marijuana, they are usually banned at school as drug paraphernalia. The consequences may include confiscation, suspension or other restrictions that are approved by the school district. I was recently suspended for 5 days from school because i was caught with paraphernalia and 2 grams of weed. it’s my first offense and i was wondering how much the fine will be and what will happen? Dear Alexia: When you go to court on this charge, the legal process will be explained to you. If you admit what you did, the court will decide the penalty. If you plead “not guilty,” the court will set a trial date. If you are determined to be guilty following a trial, again the judge will decide the penalty. It could include probation with specific terms, community service, a fine, drug classes, etc. Discuss the options with your lawyer. Good luck. Dear Hope: Schools have strict policies regarding the use of drugs at school or at school events. Take a look at the school’s Student Handbook for the specifics on this. Many schools handle these incidents in-house, meaning the police aren’t involved but drug counseling and random testing may be imposed. We suggest you discuss this with the principal or vice-principal to learn about their policy in matters involving their students and drugs. Good luck. 2 days ago I was caught with a nickel of marijuana in school it wasn’t mine I was holding it for a friend but I was caught with it it was my first offense what will be my options and consequences? Dear Andrea: Because this is your first offense and it involved a small amount of marijuana, you may be offered a diversion program and given the opportunity to avoid a record so long as you complete the terms of the program. This typically includes community service, payment of a fine and possibly having to attend an educational class or counseling. You will find out more when you go to court including what your options are. Good luck. I was charged with a first offence possession, for 2 tenths of a gram of marijuana. I was told (by arresting officer) that I would most likely receive parole, but my 18th birthday is before the minimum 6 months. What does this hold for me punishment wise? Dear Emma: It’s possible that you could be offered a diversion type program if this is your first offense. This means that once you complete the terms of the program including community service, payment of a fine and possibly having to attend a class or counseling, the charges would be dismissed. However, for information specific to the laws in your state, you could try Googling the name of your state and the exact name of the offense you are charged with according to your citation and/or court records. Good luck. Dear Tomas: There are a number of factors the judge will take into consideration when sentencing you. First, your age and history with the court. If this is your first offense, the penalty may be lighter than if you’ve been before the court several times for similar crimes. So, you could be placed on probation for a period of time, ordered to complete some community service, participate in drug counseling and/or random testing, be given some time in detention or even sent to the department of juvenile corrections. Talk this over with your lawyer who will advise you about the consequences you face. Good luck. Dear Rubi: Every state has laws about the use and abuse of specific drugs. To obtain more information about this, you can google the name of your state and the drug you’re concerned about. You could also contact a local juvenile court and speak with a probation officer who should be able to fill you in on the laws where you live and the consequences when the laws are broken. Good luck. My son got caught with a cigarret of marijuana less than 1 once in school.. What would happen to him?? Dear Jessica: Take a look at the school’s Code of Conduct and Student Handbook for the rules and penalties for possession of drugs on campus. They may be on the school’s website. It’s possible that he’ll be expelled or suspended. Many schools across the country have “zero tolerance” policies regarding drugs and weapons. Good luck. Dear Claudia: Since these charges against you are drug-related, there’s a good chance you may have to drug test on occasion. If these are your first offenses, you may be eligible for a “diversion program” that may include random testing. Once you complete some community service, a class or counseling, the charges will be dismissed and you won’t have a record. Good luck. While I understand that it is illegal, spewing false information about chemicals that are in marijuana is not the way to do it.